The first lesson is the importance of inspiring and engaging employees from the very start. If you look at Apple’s retail job postings, you’ll notice immediately that they’re very different from your typical retail or business job description. The first paragraph in the job description for a Specialist (as Apple refers to its sales staff) is a perfect example. 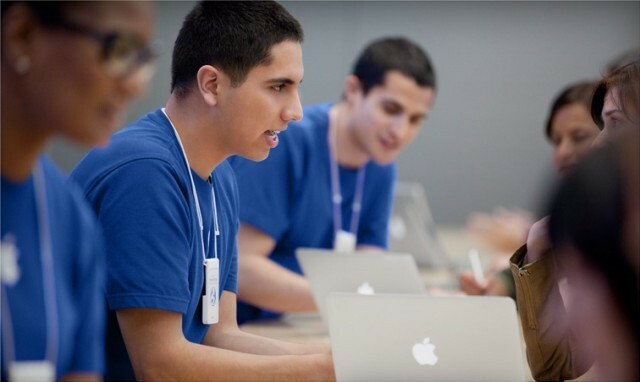 As a Specialist, you’re the essence of a customer’s experience at the Apple Retail Store. You enrich people’s lives through meaningful dialogue about the coolest products on earth. You earn trust by recommending solutions that do more than meet people’s needs—they inspire their hopes and dreams. And you thrill customers by consistently finding ways to make their ownership experience better than ever. That paragraph really sells the job and differentiates it from other retail work. It immediately inspires the person reading it, shows that Apple will value a candidate if he or she becomes a Specialist, and it appeals to the need that all human beings have to feel that we’re part of something bigger than ourselves. It also offers a pretty clear picture of how and where an Apple store Specialist fits into Apple as a company. Equally important is that this description clearly defines the type of person that Apple is looking for – someone who is outgoing, enthusiastic about Apple products, engenders a sense of trustworthiness, and who will guide customers but not pressure them for a sale. That also helps weed out people who wouldn’t be a good fit with Apple. The big lesson here is that when you write a job post or interview a candidate, you need to sell your company and the position. There a few reasons that this is truly important. It can encourage more applicants and therefore a better range of choices. It can help ensure that your ideal candidate will be interested in taking the job when offered (do it well enough, and they may take the job even if it doesn’t meet their desired salary). It also makes it very clear who you’re looking for and can reduce the number of inappropriate resumes you’ll need to wade through. 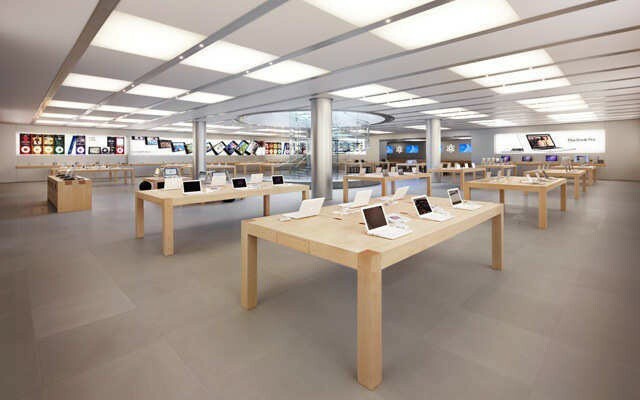 One of Apple retail’s more interesting practice is applauding its new hires. While that sounds a little hokey, the technique actually has some merit when you think about it. It establishes that new hires are valuable and it offers a way to break the ice and introduce people. A room full of people cheering may not be appropriate for every new employee in many companies, but the concept of showing appreciation for them and making their first day a real introduction rather than a tedious orientation practice is certainly valuable because it establishes them as a valued member of a team. Big lesson number two is establishing an environment where employees are encouraged to share knowledge and cross train each other. Apple doesn’t explicitly mention cross training in any of its retail job descriptions but it does repeatedly imply it by talking about things like a collaborative spirit, a readiness to learn, and being a team player. Establishing cross training is key to many organizations and departments. It ensures that things can go smoothly if someone is out sick for a single day or is out of the office for an extended time frame. It also helps preserve institutional knowledge across employee turnover in way that even the best documentation can’t (and let’s face it, a lot of institutional knowledge doesn’t get documented well). For employees cross training and sharing knowledge can improve skill sets and that interaction is a form of professional development. There are a handful of different ways to encourage employees to gain knowledge from each other. One of the most common is to simply have one staff member shadow another for a few days – a great approach for new hires. Some companies also use a team approach in which a three or four people are teamed up with each member possessing different skills. The team works together over the course of a few weeks or months. During the process, the team works on projects involving each team member’s area of expertise – an approach can be incredibly effective in cross training and building institutional knowledge if you can implement it. Lesson number three is all about relationships and interaction. Many people are disoriented on their first visit to Apple store. There’s no cash register, very few shelves of product, and often there’s no real visual focal point beyond the genius bar. In reinventing retail, Apple took all of the typical retail items out of the stores to make them a blank canvas that invites shoppers to play and ask questions. The feeling is almost like being in an interactive museum. Apple stores can easily be mistaken for museums or even offices because most retail elements have been pared back so completely. Most companies can’t get rid of a lot of the business items in their offices in an effort to be so minimalist. That doesn’t mean, however, that some of the fundamental elements of the Apple store experience can’t be recreated. Reducing cubicle walls and other physical barriers between people can go a long way towards encouraging collaboration and good old human interaction with your coworkers. Such open concept workspaces are actually a growing trend in office design. Beyond the physical space, the focus in Apple’s stores (and most of its products) is removing barriers between people and content. That perspective can serve businesses in all kinds of ways. Reducing barriers between workers in different divisions to create a boarder team atmosphere is one way to interpret the Apple store concept. So is breaking down barriers to customer or client interactions by using technology (the iPad is a great example since it reduces the physical barrier a laptop can create), meeting spaces, and even simple follow-up calls or emails. Perhaps the most effective barriers to break down are those between managers and the employees that report to them. So many excellent things have been written about this topic that I’ll just point out that employee productivity, creativity, and job satisfaction all go up when you feel that your boss is someone that is genuinely interested in you as a person and acknowledges your value. That makes it easier for employees to offer feedback, share ideas for new projects, and even just engage in conversation. Managers do set the tone for their divisions or departments and an open door policy can go a long way to creating a vibrant and positive corporate culture. That brings us to lesson number four: recognize achievements privately and publicly. I really can’t say if this is a widespread policy for Apple retail, but it certainly seems to fit with the Apple store corporate culture. Recognizing achievements can be very effective in any workplace. At the end of the day, it simply feels good to know that your employer values you. Having someone acknowledge your hard work and the benefits that you brought to a recent project helps motivate you to take on other projects and responsibilities. The integration of enterprise social networks and the adoption of policies based on game theory (a trend known as gamification) are this century’s version of venerable concepts like the employee of the month. One example that shows how simple and effective these concepts can be is Pride, a mobile social app for teams and startups that we profiled last month. Pride makes it easy for team members to communicate, answer questions, offer advice, and acknowledge each other’s contributions. More elaborate examples include systems with foursquare-like badges that acknowledge different projects or milestones. A way to take the gamification approach even further is to create separate teams that work towards similar goals and compete with each other. The goal isn’t to be particularly competitive. The basic team experience will usually members bond more and to have more dynamic relationships. That approach may not work for every employer, but it is an interesting option to consider. If that approach seems to competitive, then consider non-work team activities like fantasy sports leagues, interdepartmental sports teams, and more direct gaming through desktop or mobile apps. That kind extracurricular activity can be very effective in driving a team mentality without forcing people to compete directly in the workplace. If you need more gamification ideas, the Gamification Blog is a great resource. A related option is to give back to the community through volunteerism. That can take many different forms from answering phones during a pledge drive, to building homes for Habitat for Humanity, to taking part in a walk or run for charity. Whatever form volunteer projects take, they deliver unique out-of-office interactions with a positive focus. Of course, they can also raise the profile of your company or organization. There are probably hundreds of different ways that any manager or executive could implement these ideas. What they all come down to is the fact that the way a company (and its managers and executives) treats its employees and its customers is what builds a corporate culture – something that Apple seems to be very skilled at doing.